Here’s an easy stylish pair of bags – great for beginners. Easy sewing with few seams and the zipper is a breeze! Confident sewers will be able to finish a bag in class. Kits available at Lyons Quilting or choose your own ribbon/fabric combinations. Mary has changed the pattern so that you can make the main part of the bag from fabric if you don’t want to purchase the wide velvet ribbon. If you would like to use fabric, please purchase a ¼ yard cut from WOF (not a fat quarter) in addition to the other ribbons listed on the pattern. You will need another ¼ yard cut from WOF for the bag lining. 1 zipper – please buy YKK zippers available at Lyons Quilting. 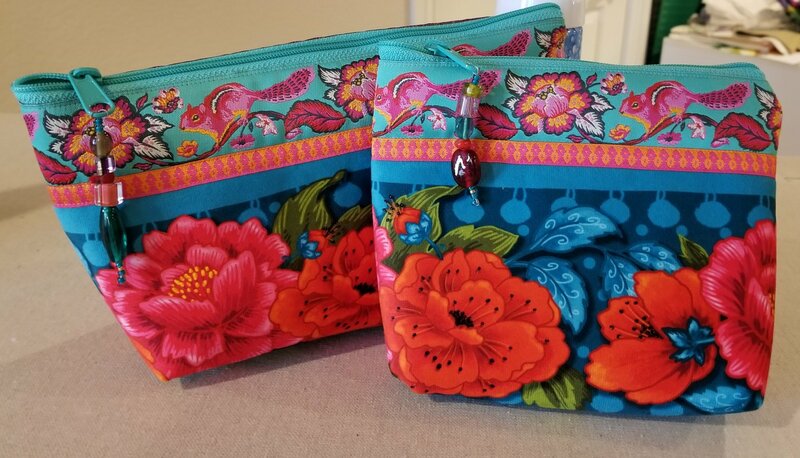 One 22” zipper will make both sizes of bags – that’s right, one zipper for 2 bags! Sewing machine with all the usual supplies including a quarter inch foot. You will also need a zipper foot. I recommend a size 90 needle for assembling the bag. For thread, I recommend Aurifil for piecing – some of the stitching will show so pick a color that either doesn’t show at all or looks really pretty! You will also need some invisible thread (the clear stuff) for attaching the ribbon. Rotary cutter & quilter’s ruler – I recommend a 12 ½” square ruler but whatever you like best will be fine. Marking pencils – bring one that will mark on dark fabrics & one that will mark on light fabric. All your favorite sewing notions such as pins, scissors, tweezers, seam ripper, etc. I also recommend that you bring a bottle of Mary Ellen’s Best Press. Pre-class preparation: None! You don’t have to quilt this bag. Any questions? Email Mary at maryramsey@yellowdogquilts.com or call/text to (520) 247-1359.